Use the scraps you received in the swap in January (if you didn't participate in the swap, just go into your own fabrics/scraps and randomly fill a quart-sized zip-top bag of your own scraps to use). Make a "modern" quilt project using one (or both) of the following two modern quilt "themes": Improvisational piecing and/or Asymmetry. Challenge pieces for the Philly Guild will be due at our February meeting on February 21. Also, this challenge provides a perfect opportunity for those of you who blog or use Flickr to participate in the Stitched in Color "Scrap Attack Quilt-Along". 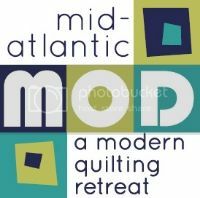 If you have any questions feel free to e-mail the officers at phillymodernquiltguild@gmail.com.